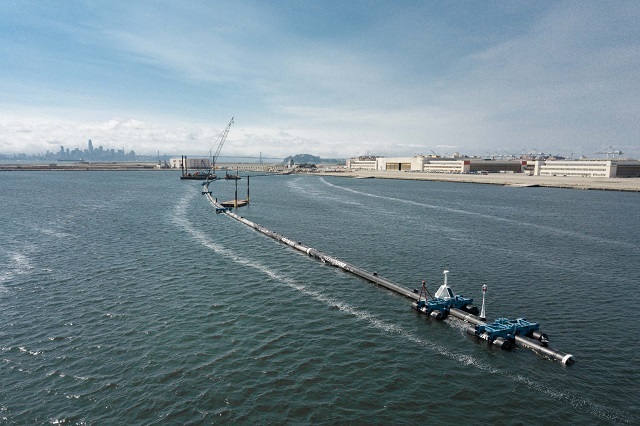 The Dutch non-profit Ocean Cleanup launched the world’s first ocean cleanup system from the San Francisco Bay on Saturday. 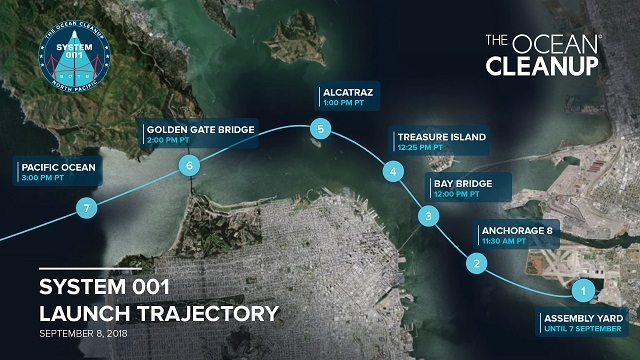 The cleanup system (System 001) is heading to a location 240 nautical miles offshore for a two-week trial before continuing its journey toward the Great Pacific Garbage Patch, 1,200 nautical miles offshore, to start the cleanup. System 001 is being towed from the San Francisco Bay by the Maersk Launcher, which has been made available to the project by A.P. Moller-Maersk and DeepGreen, its current charter holder. 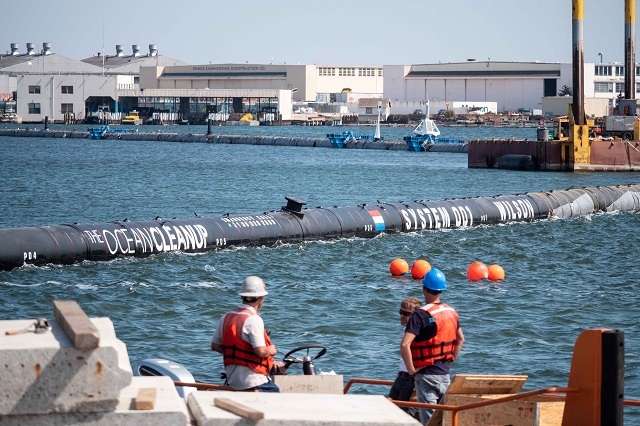 After hundreds of scale-model tests, a series of prototypes, research expeditions and multiple iterations, The Ocean Cleanup has enough confidence in its technology to launch its first full-scale cleanup system. System 001 consists of a 600-meter (2,000-foot) U-shaped floating barrier with a three-meter (10-foot) skirt attached below. The system is designed to be propelled by wind and waves, allowing it to passively catch and concentrate plastic debris in front of it. Due to its shape, the debris will be funneled to the center of the system. Moving slightly faster than the plastic, the system is anticipated to act like a giant Pac-Man, skimming the surface of the ocean. The system will be deployed in the Great Pacific Garbage Patch, the world’s largest accumulation zone of ocean plastics. Situated halfway between Hawaii and California, the patch contains 1.8 trillion pieces of plastic and covers an area twice the size of Texas. The Ocean Cleanup anticipates that the first plastic will be collected and returned to land within six months of deployment. This will mark the first time that free-floating plastic will have been successfully collected at sea. After returning the plastic to land, The Ocean Cleanup plans to recycle the material into products and use the proceeds to help fund the cleanup operations. While the main objective of System 001 is to prove the technology and start the cleanup, a secondary goal is to collect performance data to improve the design for future deployments. Hence, the system is equipped with solar-powered and satellite-connected sensors, cameras and navigation lights to communicate the position of System 001 to passing marine traffic and enable extensive monitoring of the system and the environment. After delivery of the system to the Great Pacific Garbage Patch, the Maersk Launcher will remain active as an observation platform for several weeks. Once successful, and if the funding is available, The Ocean Cleanup aims to scale up to a fleet of approximately 60 systems focused on the Great Pacific Garbage Patch over the next two years. The Ocean Cleanup projects that the full fleet can remove half of the plastic in the Great Pacific Garbage Patch within five years’ time. This is in line with The Ocean Cleanup’s ultimate goal: reducing the amount of plastic in the world’s oceans by at least 90 percent by 2040.